When it comes to Camaro versus Mustang, we’re currently seeing the most exciting and diversified pound-for-pound war between the two American darling cars in nearly 50 years. 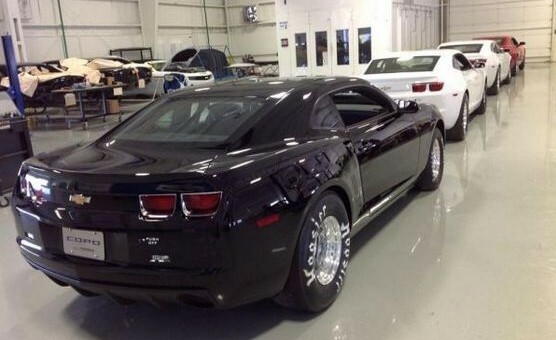 For every one of Ford’s Mustang variants; the V6, GT, Boss 302, GT500 and Jet, there’s the Camaro V6, SS, 1LE, ZL1 and now, the COPO. With plans to only produce exactly 69 of them, the purpose-built Chevrolet COPO Camaro drag racers will take the fight to the Blue Oval on the drag strip front. And the first finished examples of them have been loaded onto a Reliable Carrier and are on their way to their new owners. These examples are numbers 3,5,7 and 9. Each of them have been chassis certified by the NHRA, and are 100% eligible for sanctioned competition. The video below features one being loaded into the carrier, where we’re teased by listening to its healthy idle. Which one is Alex’s new ride? That has got to be the most beastly factory exhaust note I’ve ever heard. Wonder if we’ll see one or two of them cruisin’ Woodward next week? Cannot be titld or licensed.To quote Chevrolet…It is specifically offered for off-highway, competitive NHRA use only. It cannot be registered, titled, licensed, or driven on public roads or highways. The COPO Camaro is designed to NHRA racing specifications, including a solid axle and a full chrome-moly roll cage. Inside, most of the standard sound-deadening and power accessories have been deleted in order to optimize weight for NHRA racing. Also included: a pair of racing bucket seats (no rear seat), a safety harness for the driver, a competition floor shifter, and Chevrolet Performance gauges. I could only imagine getting to see one of these. The video is great but in person would be good. I like the camero drag look. You have a chance to buy one now! One of these amazing productions will be auctioned at Mecum Auction on November 16, 2012, in Anaheim, CA., at the Anaheim Convention Center. I wouldn’t miss a chance to purchase such an iconic car that probably has one of the most important heritage of all American muscle cars.